What happens after the pet has passed away depends on the owner's wishes. Regardless of which option is chosen, I generally make an ink paw print on a sympathy card, and a clay paw print to be baked later. Both are sent to owners after the euthanasia. There is no additional charge for this. Each one is handmade and unique, and many owners are comforted by having these keepsakes of their pets. An owner may decline, however, if they do not want this done. 1) Home burial - You may choose to bury your pet on your property. 2) Communal cremation - Your pet is cremated by Final Gift with other pets and the ashes mixed so you will not get the ashes back. 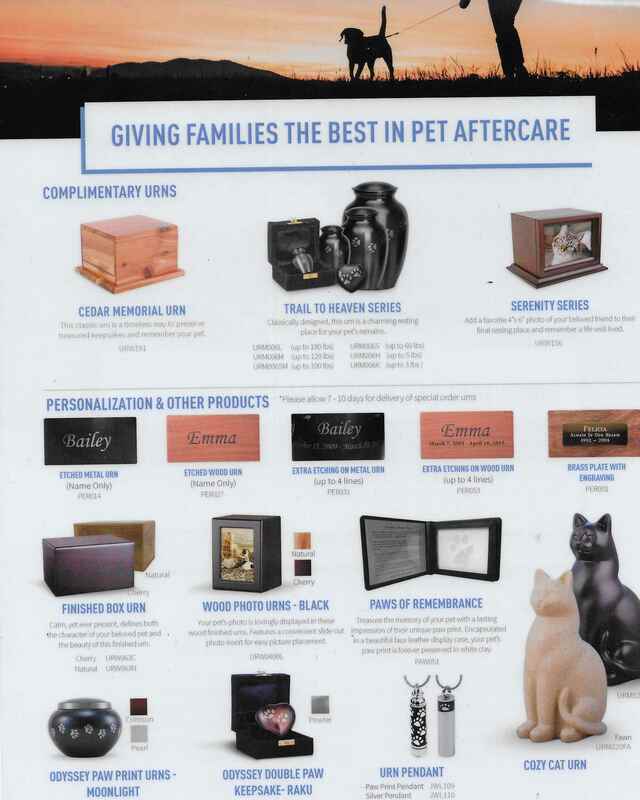 3) Private cremation - Your pet is individually cremated and the ashes are placed in an urn, usually in about week. You can have your pet returned to you via UPS signature required for $25, or pick them up, by arrangement with Dr. Sernik, at 178 Baboosic Lake Rd, Merrimack, NH (Bishop Field). It is a small athletic field at one of the four corners of the only traffic light on this road. Some people bury their pet's ashes, or scatter them in a place special to the pet, or keep them in their homes. You will have a choice of three urns included in the price of the private cremation. You can also purchase a variety of urns from Final Gift's catalog, though I have found many of the same urns elsewhere on the internet for less. Final Gift also offers small necklaces that they will fill with your pet's ashes. Their website is www.finalgift.com. 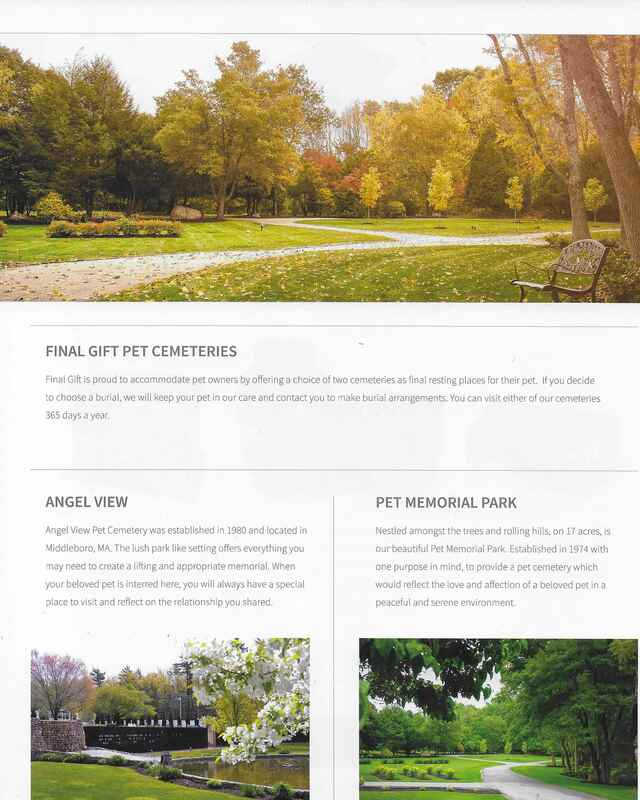 4) Private burial in a pet cemetery - There are pet cemeteries in various locations around the area. There is a wonderful option to have some of your pet's ashes put into a hand-blown glass memorial by Terrapin Glassblowing Studio. Please see their website at www.terrapinglass.com/memorials. Vangie Collins makes glass Cremation Beads with your pet's ashes in them. Please visit her website at www.vclampwork.com. If you have a quantity of your pet's hair and want to have something created from it, Nancy at Hair of the Dog spins pet hair into yarn and makes a variety of things like hats, scarves, and purses from it. Her website is www.designerdogyarn.com. getanamenecklace.com will make a beautiful engraved sterling silver necklace of your pet from a photo you provide. Cuddle Clones will make an exact plush replica of your pet to have forever. You can visit them at www.cuddleclones.com.